This KHR-2HV beats up KHR-1’s on the playground and steals their lunch money. I-Wei, the mechanical guru responsible for the many fascinating creations of Crabfu Steamworks, has recently jumped headlong into the world of humanoid robotics. Ever since he purchased his KHR-2HV, he has been keeping the world updated on his progress by releasing a steady stream of impressive videos. 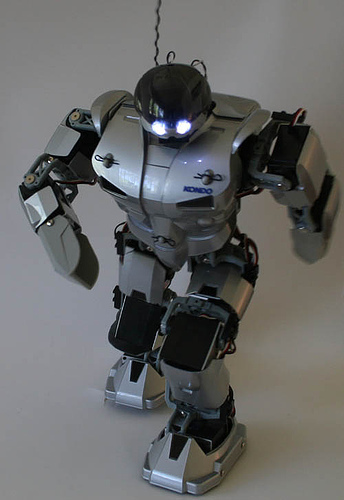 His latest contribution is a tell-all review of Kondo’s A-621 Genex suit for the KHR-2HV humanoid. He goes into detail regarding everything he likes and dislikes about the kit, and also provides valuable tips and pointers. Go check out the A-621 Genex suit review over at Robots-Dreams!